THE ADDRESS Magazine No 18. A gorgeous celebration of fine living, THE ADDRESS is a luxury lifestyle and property magazine with cutting-edge reports and dazzling lifestyle features. With its elegant and glamorous style, here is where luxury lifestyle stories on food, travel, design and well-being complement an elegant showcase of some of the world’s finest homes for sale. with inspiration and information from the international luxury property and lifestyle markets to see you through summer 2014. Luxury real estate in Costa Rica is once again hot on the radar of investors from around the world. Buyers are attracted by the country’s developing infrastructure, stable democracy, low cost of living, world-class healthcare system, and the amazing lifestyle. Our curated selection of modern homes in Costa Rica is sure to steal the attention of cutting-edge design lovers. Emphasized by fresh, stylised aesthetics in a stunning natural environment, these tropical homes are in a league of their own. of elegant hotel residences, home-sites and grand estates for sale situated on more than 5,600 private acres in the heart of the Ongamira valley, in the province of Córdoba, Argentina. Every once in a while you find a place that is so special and unique – this jungle retreat in Belize offers the ultimate in rainforest experience. The holiday homes for sale possesses a truly special allure, embodied by their unsurpassed scenic beauty, attractive rental yields, Old World elegance along with a full range of hotel amenities. As one of the most scenic regions in Europe, the area of Italian Lakes showcases some very elegant residences for sale. Unfailingly delighting investors for decades, the area offers a quality of life and level of security that are particularly prized by its residents and second homeowners. Perhaps the main draw of the French Alps in summer is that it is just as much a playground for outdoor lovers as it is in winter for skiers. Dramatic Alpine scenery and unspoilt breathtakingly beautiful landscapes form the perfect backdrop for many of our luxury ski properties for sale, including Courchevel 1850, Megève and Les Gets. In addition, the summer issue of THE ADDRESS Magazine also includes a magnificent estate in Andalucia, a stunning mansion house just outside Paris, a magnificent waterfront estate on the French Riviera along with several other fine homes for sale. The market insight features in this issue include “Market insights from around the globe” and “Thailand: Real Estate in the Land of Smiles”. From Michelin-starred restaurants to timeless, casual eateries, the feature “Food & Travel Around the World” lifts the lid on some of the world’s most inspirational cooking. And finally, Selected by TA showcases some recent discoveries in global style, design and good living. 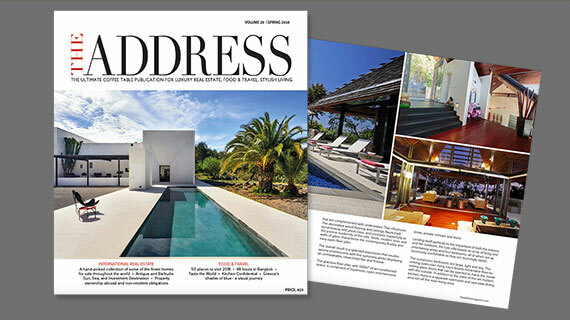 Enjoy the latest issue of THE ADDRESS Magazine! Smartly designed and charmingly cosy, the new 3- and 5-bedroom mountain homes offer generous space and well-appointed comfort. A rare opportunity to indulge in the choice of stylish properties, ranging from hotel residences, to homesites and grand estates. A divine view. An inspired lifestyle. The luxury ski apartments are infused with authentic charm and Alpine style combining traditional Savoyard materials with the elegance of contemporary comfort. Beautifully appointed with 400m² of living space, the villa features six bedrooms, including a master suite with its own terrace, dressing room and bathroom. Hidden behind a tree-lined lane sits one of the most luxurious and exquisite estates in Yvelines.